155p soft-cover book and CD. 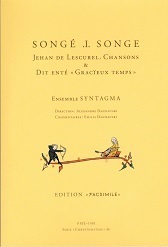 Includes texts in Old French with Modern French, English and German translations. Detailed notes in French and English. First an apology. I received this book and CD several months ago, noted that there didn’t seem then to be an outlet on disc or as a download in the UK or US, and decided to put it in a safe place until I could add a purchase link. The inevitable result was that I forgot all about it until I received an email from Syntagma gently reminding me – and even then I forgot that I had it at first. Even as an undergraduate my memory was highly selective: 50+ years on it certainly hasn’t got any better. Having apologised to Syntagma, I also owe an apology to the select group of readers – perhaps not so select – to whom this music will appeal. 1 The ‘autobiographical’ passage added to the C text of Langland’s Piers Plowman should similarly be viewed with caution. 2 I don’t want to get into too much detail here about the fine points of Courtly Love. It’s better that I reserve consideration for an article on fin amours in music. English readers who are interested in the topic should read C.S. Lewis’s The Allegory of Love (Oxford University Press). The book appears to be out of print but you should find a second-hand hard- or paperback copy; there’s even a Kindle version. The editions of Roman de la Rose by Lecoy and Poirion are hard to come by in the UK but portions are available online and Frances Horgan’s translation is available as an Oxford World’s Classics paperback. 3 From Jehan de Lescurel’s treatment of the Courtly Love theme, you may wish to progress to Gothic Voices’ presentation of what a later period made of this theme in two budget-price reissues: The Garden of Zephirus (CDH55289: Bargain of the Month – review) and The Castle of Fair Welcome, (CDH55274: Bargain of the Month – review).